That one made me laugh out loud. I mean, yes, I include meat in a lot of my recipes, but it never occurred to me that that would be a key word to describe the site. But then I thought about it a bit harder. I DO like meat. I DO include meat in a lot of my recipes (or even make recipes that are just meat, like my spicy chorizo recipe, and this here breakfast sausage recipe.) I firmly believe that having the correct portion size of protein in your meal is a healthy choice, and I fully support eating non-CAFO, humanely raised, as local as possible, meat. And if there are people out there who don’t like my site because it has too much meat, so what? I’m sure there are also people out there who don’t like my site because I’m mostly paleo, or because I’m sarcastic, or because they think I look funny. Those are not my people. YOU are my people, which is why you’re still reading when I’ve been talking about meat for the past 3 paragraphs. So thank you. Thank you for being here, listening to my ramblings, trusting my kitchen experiments, and being all-around awesome. 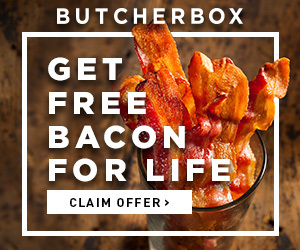 Thank you for your support, your honesty, and your love of meat. Amen, sister. 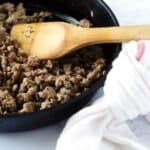 Meat lovers unite, and enjoy this incredibly delicious, perfectly seasoned breakfast sausage recipe. It’s sugar free, Whole30 compliant, and tastes way better than any pre-packaged sausage you’d buy in the grocery store. And in the near future, when I post a recipe for a delicious breakfast hash that uses this sausage, I hope you’ll be glad you stuck around. Combine all the spices and seasonings in a small bowl and mix well. In a large bowl, add the spice mixture to the ground pork. Mix well, trying not to overwork the meat. If cooking into patties, form the patties with your hands. Heat a cast iron skillet over medium-high heat. Add the loose sausage or sausage patties to the skillet and cook until no pink remains, about 7-10 minutes. For patties, cook 4-5 minutes per side or until cooked through. I made 2 batches of this sausage today!! It came out so good!! Thank you!! 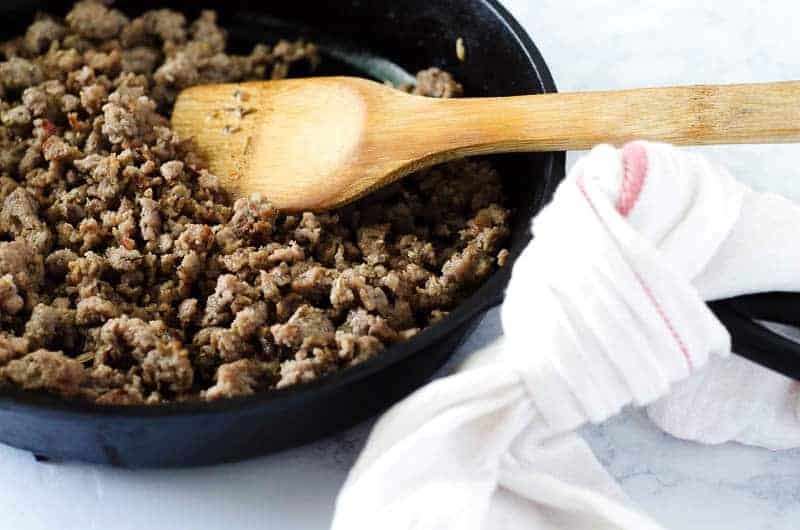 It was a little on the salty side for our tastes, but the flavor of the sausage with this recipe was better than any other recipe I’ve tried so far! We’ll try it again with a tad less salt and a little adjustment on seasonings. This was great, though!! Glad you enjoyed it! Everyone’s tastes are different, for sure – I love that you’ve found it as a base and can tweak it to your liking! I would suggest only doing a 1/4 tsp of cinnamon. It came out with a stronger cinnamon taste than I expected. Thanks for the suggestion! Flavors are definitely preferences that are unique to the individual, so I’m glad you found an option that works better for your taste buds. That’s what “scaleo” is all about – scaling to find an option that is right for you!